With IronTree backup, for example, you’re a simple few steps away from having your vital documents safely stored in the cloud at a state-of-the-art data centre in Johannesburg. But what does backing up online entail? How does it work? Following a simple registration process, an IronTree consultant calls you to set up the installation. He’ll ask your permission to access your computer remotely and you can watch, or wait, while he configures the software and gets it running on your machine. The consultant will also help you with your data selection by asking questions to determine which documents you can’t afford to lose. Once you’ve chosen the items to be backed up – whether these are files and folders or any variation of these such as a single file inside a folder or an entire folder – their locations will be recorded by the software. Note that you aren’t required to move your files or folders into a designated backup folder like you have to do with DropBox. Once you’ve made your selection, the IronTree software remembers the locations of the documents and transmits frequent backups of this data automatically. At the configured frequency (usually daily), your backup set will be securely encrypted before being sent via the Internet to the IronTree servers at our secure data centre for safe storage. It doesn’t matter if a file you’ve chosen for backup is in use at the time of the scheduled backup. If, for example, you forget to close your accounting application before going home, your backup will still go ahead. If your computers are switched off or not online, the IronTree agent will sense when they’re online and powered on again and resume from the point of last successful transmission. For backups to be transmitted, computers need to be on and connected to the Internet. Sixty generations of your backup set will be kept by IronTree at a time, which means that if you backup once a day, IronTree will store 60 days of backup. 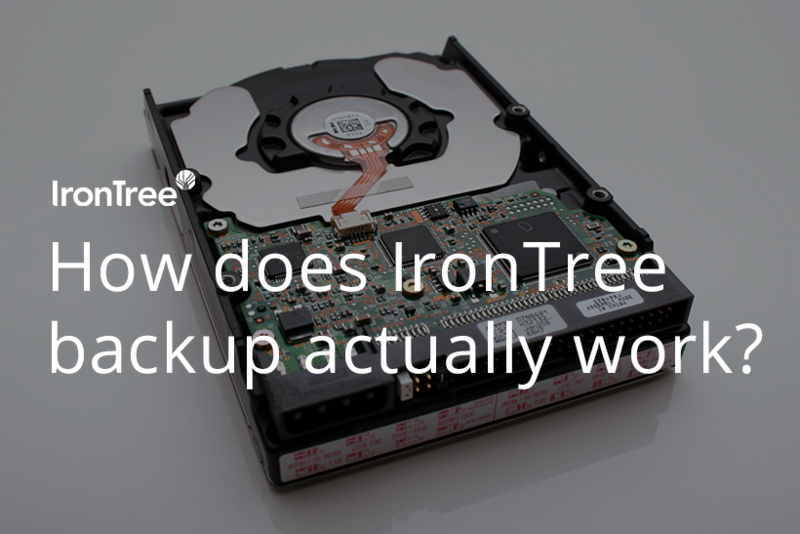 If you backup every five minutes, IronTree will store the past five hours of backup because only 60 increments can be stored at a time. You’re able to restore data to any point covered by the generational backup catalogue, even if you mistakenly delete a file. You can choose the time of day or night that your backup takes place, and this can easily be changed in the software configuration. Registration and installation of IronTree backup is so straightforward that by the time the consultant logs off, your first backup will already be in the process of being encrypted and transmitted.